One day this beautiful Pit Bull showed up at a local bar with a rope tied tight around his neck and under weight. The owner of the bar fell completely in love with him, he named him Blue and wanted nothing more but to keep him. But having already four other dogs and not knowing how the dogs would get along, he called the dog pound. 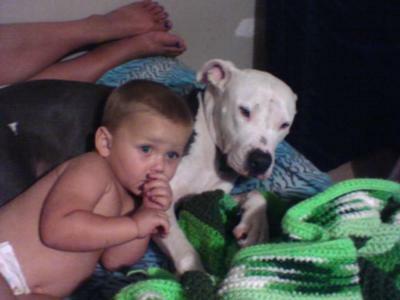 They told him that if they took the dog the would have to put him down JUST because he is a pit. He didn't want that to happen so he decided to find a good home for him while he looked for the owner of the dog. My grandmother is really good friends with the owners of the bar and she also knows that my mother and I will take in strays until we can find them a good home for them, so she immediately called my mom and I.
I, like the owner of the bar, fell in love with this dog as soon as I saw him. My mother, on the other hand was a little shy to taking this dog home because she didn't like Pit Bulls. We already had a dog and was told by the vet to keep the two dogs apart for a couple of days because Blue had kennel cough. When it became night time my mother went crazy and told me to lock the dog up in my room. She had also boarded up my door way, the kitchen door way and her door way with Brownie (our dog) in her room. After a couple of days had passed, I started out just letting the two dogs sniff each other, but my mom was having a really hard time with this. She was really scared that Blue was going to eat our dog Brownie up. So I decided that I was just going to let the dogs get to know each other without my mom. To my mothers surprise the dogs became best friend! Blue was as gentle as ever with her. She also had the same problem with letting Blue around my two year old nephew. Though, after seeing the way he acted around Brownie, she was a lot more understanding. It also turns out that Blue is GREAT with kids. My nephew can do anything he wants to Blue and Blue will just lay there or just walk off. I got Blue in August of 2011 and he just turned two years old in January. He is truly the best dog i have ever owned and I couldn't imagine my life without my fury son! What a beautiful story!! You are a wonderful person!! That story made me cry. I love when peoples' hearts are changed. Thank you for giving this precious boy a chance at love! by: kelly and Axel Foley, my pit. Great story! Not only did you fall in love with him you also turned your mom into being a little more relaxed around pitbulls. If only we could do this to so everone who understands. This site is used by Pitbull lovers and would'ent be great if was the Los Angeles Times or any widely circulated papers. its true when i first saw him i was like where did you get that then after we had him for a while i started to like him and then he became a famliy dog to where we started arugueing about who he was gonna with at nite but im glad we have him hes a really good dog im supirsed that he turned out to be a good dog after we found him on the side of the road for a pitbull.